This week’s Throwback Thursday pic is of the O. Orechkin commercial and apartment building. Located at 588 Wyandotte Street East at the corner of Aylmer Avenue. The photograph was taken in 1927 when Ozedore Orechkin owned the building. Today the building still stands with only some slight modifications to its appearance. 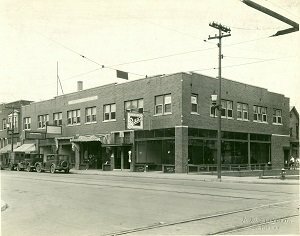 If you are interested in viewing more photographs from Windsor’s past, please visit the library’s digital exhibit “Windsor’s History and Pictures” at http://heritage.windsorpubliclibrary.com/.